My husband and I both love Harry Potter. To be more specific he likes the movies and I like the books. 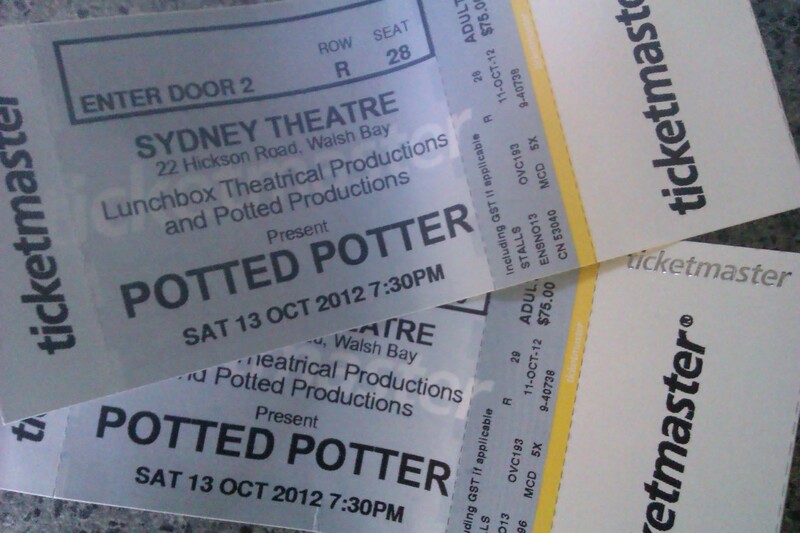 So when I discovered that there was a play on in Sydney this week only called “Potted Potter” I launched into action. It would be the perfect compromise date with 7 books in 70 minutes. I wouldn’t be fuming all the way through about how it wasn’t like that in the book and he wouldn’t be giving me dirty looks for talking all the way through the movie. I bought some tickets, found a babysitter and then we were on our way to a night out sans children! Of course the reality was that we were running late so we dropped in for a McDonalds meal on the way there (so romantic) and then found a parking spot near the theatre but a broken ticket machine so we were more than a little fashionably late. As in the show had just started! We received some dirty looks as we clambered over people to our seats. Yes we were those irritating people! The show ran at a frenetic pace with Jesse and Gary covering all the key characters between them. They had some great props (hats, puppets, toys and brooms) and even managed to get the whole audience involved in a game of Quidditch. Mighty Slytherin (our team) defeated Griffyndor on the night! There were songs, magic and lots of laughter. You know you’ve had a good time when you laughed till you cried and then can’t actually remember the specifics of what happened. It’s touring all around Australia and New Zealand over the next month so check it out! Have you seen a good play lately? What did you like about it? Previous Let’s celebrate girls! Next The luckiest guy I know….